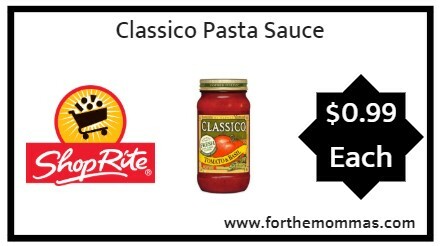 ShopRite: Classico Pasta Sauce Just $0.99 Each Starting 3/24! Starting 3/24, ShopRite has Classico Pasta Sauce priced at only $1.49 each. In addition to this, we have an Ibotta rebate to use on this deal that will make your final price ONLY $0.99 each! Giant: Sargento Sunrise Balance Breaks JUST $1.50 Each Thru 4/25!